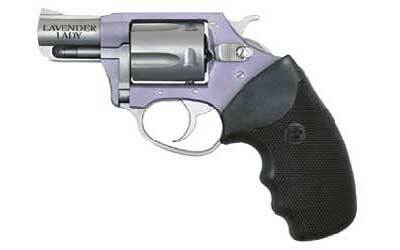 The Lavender Lady is another model in Charter's exciting line of duo tone revolvers. Like the other duo tone offerings, the heart of the Lavender Lady is the popular Undercover Lite, but with an attractive lavender anodized finish. The Undercover Lite provides impressive stopping power while weighing a mere 12oz. It is constructed of tough aircraft-grade aluminum and steel, providing rugged reliability and comfort. This ultra lightweight 5-shot features a 2" barrel, fixed sights and traditional spurred hammer. I love this gun - so light and awesome to shoot!! I love the color too!!! This is a nice light weight pistol that's easy to handle. Wife loves to shoot this - she says it does not have a harsh kick like the larger caliber pistols do for her. Also very easy for her to conceal in her purse.